The extreme-right suspect in the deadly Finsbury Park attack has admitted in court that he originally intended to kill Jeremy Corbyn when he hired a van and drove it to London on June 19th 2017. In the end the van was driven into a group of Muslims in Finsbury Park in Jeremy Corbyn's Islington constituency, resulting in one death and several serious injuries. The mainstream media have reported the fact that the terrorism suspect intended to kill Jeremy Corbyn, but in a fairly neutral manner and without any effort to apportion blame on the people who radicalised him. Just imagine the mainstream media reaction if the roles were reversed and it was some kind of radical extreme-leftist who had plotted to kill Theresa May, then driven a vehicle into a random group of people outside a Conservative club in her constituency later that day. Even if the attacker was a member of some random Stalinist cult with no links whatever to the Labour Party, we all know that there would be a concerted effort to link the attacker with Jeremy Corbyn and Momentum, and to force Jeremy Corbyn to apologise for the attack as if it was his personal responsibility. Yet Theresa May has been allowed to get away with saying absolutely nothing about it, as if extremist plots to kill her political rivals are perfectly normal and unworthy of comment. As it stands nobody in the mainstream media is holding hate-spewing Tory politicians or the right-wing propaganda rags responsible for the extreme rhetoric they used against Jeremy Corbyn, which eventually triggered this assassination plot against him. Take Zac Goldsmith's disgusting BNP-style propaganda during his failed bid to become Major of London, or the grotesquely misleading attacks on Jeremy Corbyn on the front pages of the right-wing propaganda rags during the general election, or the continued hate-inciting rhetoric of Tory MPs like Nadine Dorries. All of these people who have attempted to smear Jeremy Corbyn as some kind of supporter of radical Islamist terrorism should be held accountable when people decide to take the law into their own hands and develop assassination plots, especially after the murder of Jo Cox by a right-wing extremist in 2016. 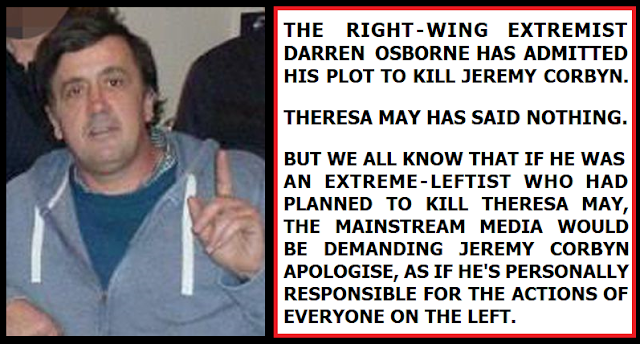 We know that Darren Osborne was radicalised by Britain First, and that he was praised and lauded as a hero in the Britain First echo chamber after the attack was carried out, but when that extreme-right organisation is actually held to account for radicalising people like Darren Osborne into plotting to assassinate politicians is a question for a different article. The big questions here are why hate-inciting Tories like Zac Goldsmith and the right-wing propaganda rags are not being forced to apologise for spreading the kind of extreme anti-Corbyn smears that inspired Darren Osborne to develop a plot to assassinate him? And why Theresa May is being allowed to get away with saying nothing when we all know the mainstream media would be desperately trying to smear Jeremy Corbyn by association, and demanding that he apologise in person if the circumstances were different? 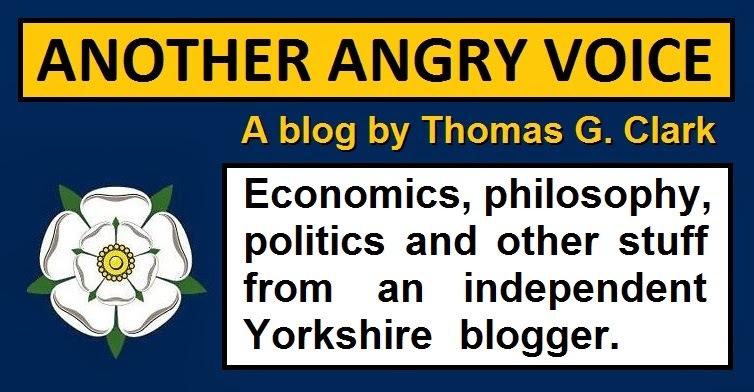 Another Angry Voice is a "Pay As You Feel" website. You can have access to all of my work for free, or you can choose to make a small donation to help me keep writing. The choice is entirely yours. This is a "Pay as You Feel" website. You can have access to all of my online work for free. However if you want to support what I do, you could make a small donation to help me keep writing. The choice is entirely yours. Has Boris Johnson forgotten that he's a Tory? Here's the reason "centrism is really struggling to make headway"
Vince Cable is actually complaining about the consequences of flogging the Royal Mail! What does Theresa May actually believe in? Thomas G. Clark. Powered by Blogger.